After our conference let out for the afternoon, Candee’s friend Anne picked us up from our hotel for a tour of Minneapolis. We walked around the Minneapolis sculpture garden and saw the Spoon Bridge (very cool! ), viewed the city from the observation deck at Forshay Tower, and saw the bronze statue that captures Mary Richard’s now-famous hat toss! 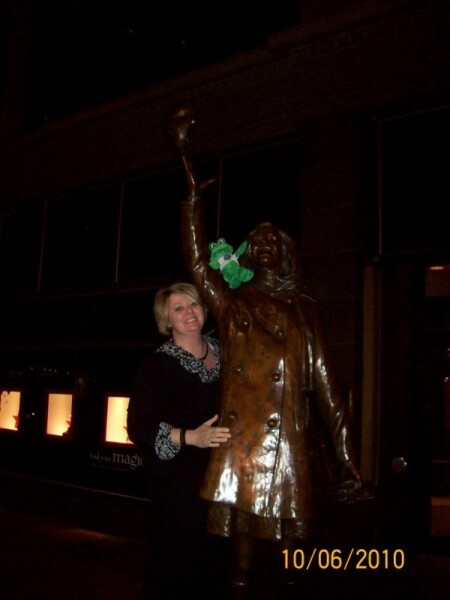 Located in front of the Macy’s Department Store near the corner of 7th Street and Nicollet Mall, the statue of the girl that made the world smile pays a special tribute to Mary Tyler Moore. The statue looks like it depicts the part of “The Mary Tyler Moore Show” where she throws her hat into the air. It’s fitting that the first modern woman on TV is pictured with the first travel frog of her kind. Go Polly!